Trim fat from steaks and cut into ¾ inch cubes. Heat oil in sauce pot. When hot, sauté the beef cubes briefly or until just browned (4 minutes). Remove to a plate and keep warm. In the same pot, sauté the poblano, onion, garlic and seasonings 3 minutes. Stir in the tomato, tomatillo and sauté 3 minutes. Add the beef back into the pot and stir to blend with the seasonings. Whisk together the beef broth and the flour until smooth. Pour flour mixture into the beef mixture. 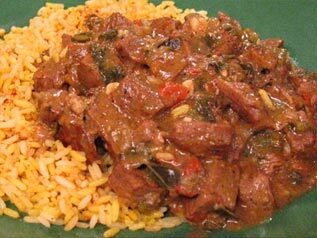 Bring to a simmer, cover and cook until the beef is tender, about 30 minutes.